Home > News > Europe > Could Ireland’s Top-Ranked MBA Program Become The ‘Most Global MBA In Europe’? Could Ireland’s Top-Ranked MBA Program Become The ‘Most Global MBA In Europe’? With the world’s top-10 pharmaceutical companies, four of the world’s top-five IT services companies, and nine of America’s top-10 IT companies boasting offices on her shores, Ireland hosts a tantalizing array of career opportunities for MBA students. The fallout from Brexit means a plethora of multinational businesses are opening offices in the Irish capital. At the same time, Donald Trump’s anti-immigration policies are driving MBA applicants away from the US. Cities like Dublin are becoming an increasingly attractive proposition for international students. “There’s huge growth in Ireland right now,” confirms Orla Nugent, MBA program director at University College Dublin’s (UCD) Michael Smurfit Graduate Business School—whose MBA program is ranked among the top-100 in the world by the Financial Times. 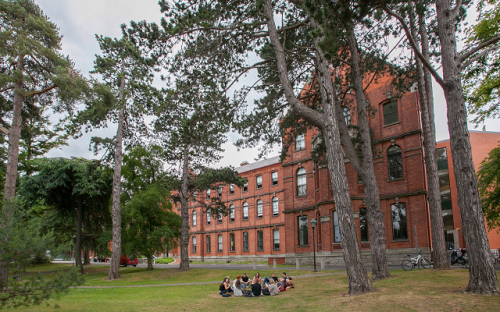 Already, the Smurfit MBA class is 70% international, and the school has revamped its full-time MBA program with its international students in mind. On the Smurfit MBA, students have the opportunity to study at an overseas institution during a global network week—an initiative led by Yale School of Management as part of the Global Network for Advanced Management (GNAM)—with a choice of 32 business schools located all over the globe. Working closely with Yale School of Management, full-time MBA students also have the opportunity to participate in the Yale Integrated Leadership Case Study Competition, a globally revered case study competition pitting teams of diverse students against one another—a team of Executive MBA students from Smurfit also won the John Molson MBA International Case Study Competition in 2018, showcasing the school’s internationally recognized expertise in this area. In the second semester of the full-time Smurfit MBA, students undertake a module in doing business in international markets, where they go abroad to gain first-hand experience of how people manage and lead in different geographies—“this year there’s one group that are going to Lima and Peru, and a second going to Hanoi and Singapore,” Orla adds. At Smurfit, exposure to global business culminates with the international consulting project in semester three—last year around 70 students went to Iceland, working in teams to solve real-life business problems for real firms. Being able to collaborate with peers from all over the globe, on real-time projects, means that the education for Smurfit MBAs spans far beyond the classroom walls. “Students need to be aware of how to collaborate across geographies and the cultural divide,” explains Orla. A diverse classroom on the Smurfit MBA doesn’t just mean exposure to a multitude of nationalities—by working with a head of marketing from a hospital, for example, or an HR director of a tech company, or an entrepreneur, students learn to adopt different industry mindsets. Nothing tests the resolve of those relationships like the Global Virtual Teams initiative, where Smurfit MBAs are introduced to research on what makes global teams triumph or fail, before they develop those skills by working with counterparts around the globe—this tests students’ ability to work across regions and countries, overcoming the barriers posed by time zones and differing cultures. Learning to maneuver cultural differences, industry mindsets, and personalities, also goes hand-in-hand with soft skill development—a key mantra on the Smurfit MBA. A Leadership Development Program runs throughout the program. For Orla, it’s vital the school creates well-rounded graduates, who develop their self-awareness, leadership, and influencing skills, complementing their academic program for greater impact. Teaching students through modules like Conflict Management, Team Building, and 360 Degree Peer Review, the Smurfit MBA equips students with a fully developed set of interpersonal skills, applicable to business in an international context—skills people are realizing are invaluable in today’s globalized business world. “Over the last couple of years, people have been saying to me, ‘I hear you have the Leadership Development Program, I think I need that,’” Orla smiles.